The Double Collar Princess Jacket is your go-to for an EASY to sew fall/winter/spring blazer or jacket pattern. The Double Collar (or single collar, or no collar at all) jacket is impeccably designed with a forward-shoulder seam (to keep the jacket from rolling back when worn), shapely princess seams and multiple, customizable lengths. For fall 2018 we're seeing tons of menswear fabrics - glen plaid, tartan plaid, tweeds. Of course, nubby boucle (knit or woven) are always popular cool-weather fabrics, too. This jacket is a great place to print-mix with your tee shirts. For fall, we're seeing a lot of pink/rose and gray - here we're showing a textured thinner rayon/wool/poly that looks like a pink solid but is print textured. It looks great with a heather gray and dark gray stripe tee shirt knit. The lighter textured woven fabric is perfect for the double collar - a chic couture detail that adds an extra something special to your outfit. On the right, a brown/cream heavier wool fabric would work great with a single collar. Shown here with a stripe French Terry, this mix of neutrals will look fabulous with jeans. If you're heading for Spring 2018 in the southern hemisphere or a warm climate, this jacket is fabulous in linen! It's unlined, so it's cool and comfortable. You can also choose a rayon-blend twill or even a silk twill. And you can make a classic "French Jacket" (you know the one we're talking about!) by omitting the collar altogether, cropping the jacket at high hip. No fussy couture sewing necessary You can add trim, including hand-crochet trim, or ribbon trim to the edges of the "French Jacket" version to look just like the famous designer jackets. On our model, Kay, shown above, it's deliciously cozy in a boucle knit and wears like a sweater coat. You can see the detail of the double collar really stand out in a lighter weight fabric like a linen, twill, silk twill or lightweight wool blend. You have a great fitting pants pattern. One that you've made several times, it's a TNT (tried 'n true) pattern for you. So why reinvent the wheel? Use it to make shorts! Some of these shorts have some fun details - try rickrack in the seam allowances for the top waistband, and sew it to the underside of the shorts hem to let the rickrack peek out. Sew a custom belt and add belt loops, or create an elastic waist using our Wide Leg pants. You can also make shorts from a heavier knit fabric, such as ponte or ITY, or from a stretch woven fabric. 1) Measure your ideal inseam depth - find a pair of shorts you like and measure those, OR pick a spot where your thigh starts to taper toward your knee. 3", 5", 7" and 10" are standard ready-to-wear lengths. 3) Decide if you want a cuff or not. If you do, add 3.5" to allow for a 1.5" finished cuff. 4) Trace your pattern off onto your fabric with kids' chalk, stopping at the new hem mark on each sideseam. Connect the sideseams with a horizontal hem line using your chalk. 6) Put on, admire your legs in a mirror and enjoy! You know you love it, your favorite hoodie sweatshirt. You love it so much, you'd love to wear it 7 days a week! Why not? All you need is an upscale hoodie. The Travel Trio Two's reversible hoodie jacket is just that. This elegant, flyaway cardigan hoodie can go from the weekend to work, and give you double the wearing, depending on your fabric choices. Travel Trio Two's upscale hoodie pattern comes paired with a great funnelneck top with 3/4 sleeves and a long or knee-length wrap skirt - the combo is perfect for work. Here, we're showing the hoodie with jeans and boots for a great weekend casual look, or with your favorite leggings and running shoes for workout wear. So, just how DO you wear a hoodie to work? Fabric choice is key. A low key print paired with black is a classic look - wear the black side out, and let the low-key print peek out at the collar and hood. Wear the hoodie with the knee length wrap skirt and heels or tall boots for a chic, but comfortable look. You can also layer the hoodie over a sleek short sleeved tee, and under a blazer. Layering a hoodie under a blazer is perfect for a meeting in the boardroom, the hood can hide under your jacket; pop it out and over the top of your blazer for after-work drinks with friends. The hoodie is becoming more of an acceptable casual workplace garment - if you're in a creative field like marketing or retail, you can definitely get away with wearing a hoodie at work. If you're in a conservative field like banking, you'll need to tuck that hood in under your blazer til after work. And if you're in technology, your hoodie may be a required work uniform (the soccer sandals are optional.) If you're a tech manager, wearing an upscale hoodie does put you more in connection with your younger sweatshirt-hoodie-wearing staff without completely succumbing to a too-casual look. The cardi-jacket has become a wardrobe staple. Many of us who have moved to a casual workplace now wear sweaters instead of suit jackets, and we certainly spend our weekend in comfortable knits. Travel Trio One's Drape Front Jacket is an asymmetrical jacket with a gathered-and-draped side tie. The jacket is easy to wear and looks great open or closed. Let's explore this jacket in more detail. On our model, Sherry, we've paired the drape-front jacket with a simple textured white tee (Three Tees, cap sleeve version), jeans and boots. This great casual look could be scaled up with slim black trousers and high heels for a daytime or evening look. Adding bright accessories, like the magenta scarf with the Drape Front Jacket transform the tee-and-jeans look from ho-hum to wow. Looking inside this jacket's pattern envelope, you will see a jacket front pattern piece with a clever darted drape. If you simply gathered up the side of a rectangular jacket, you'd end up with too much bulk to tie, let alone wear in a sleek silhouette. The Drape Front Jacket's darted drape reduces bulk, creates a trim front tie and flatters the wearer. 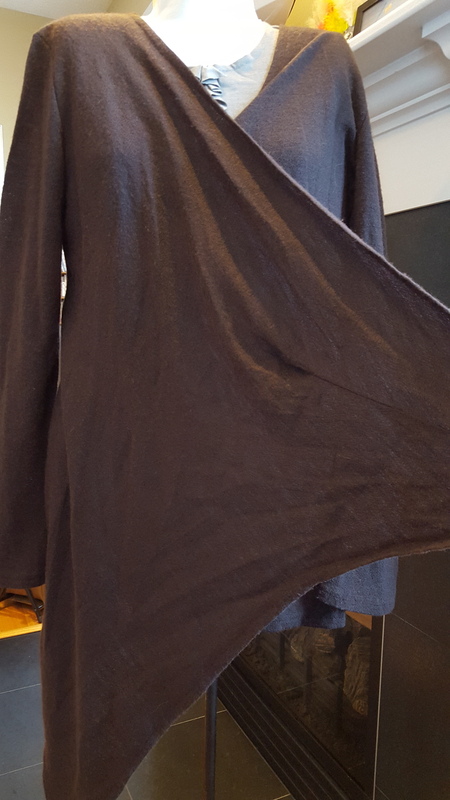 But if you want to make a non-draped version, there is a front pattern piece without the drape that creates a sleek front panel that, much like the passionately-loved wrap dress, creates a slim silhouette on all figures. The drape front jacket's construction in a drapey knit - this is a semi-sheer sweater knit, a perfect choice for the jacket - means that it skims the body gracefully, and has the coverage of a sweater coat. For a dance-sport-yoga look, wear the Drape Front Jacket over your yoga top and leggings with athletic shoes. 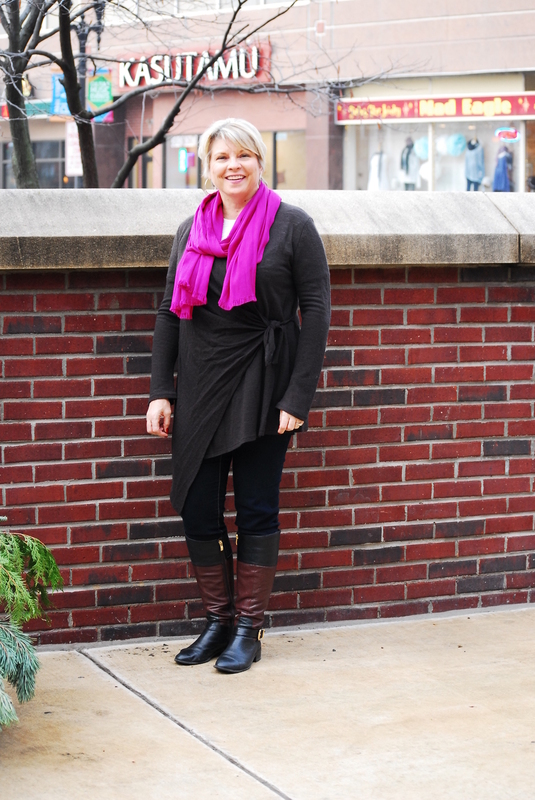 Mix it up on the weekends and wear jeans, a tee and boots with the Drape Front Jacket (like Sherry, here). For a spring version, wear colored jeans, a print tee and the Drape Front Jacket in a pastel rayon/lycra knit. Go beachy with wide-leg linen pants over your swimsuit and toss on a gauzy light sweater knit Drape Front Jacket for a great apres-pool bar look as the sun goes down. The Drape Front Jacket also goes upscale to work - pair it with a slim pencil skirt for a chic wrapped separates look. Or try it with slim black pants, high heels and a silky jersey knit top. For evening, the Drape Front Jacket is a great layer over a long slim column dress. Try this for evening in a sheer black sweater knit over a dress with your best jewelry. The Drape Front Jacket is part of the very-popular Travel Trio series and comes with a sleek banded-neck tee, and boot cut front-seamed pants with a flat stretch waistband. We love the jacket. It adds that perfect 'third layer' that pulls together an outfit. Jeans and a tee shirt? No problem - a jacket or blazer instantly polishes the look. And with unlined jackets, not only is the sewing EASY, but the jackets feel like sweaters! Let's get some inspiration and then look at interior jacket construction. The Boyfriend begs to be worn with skinny or boyfriend jeans (slim) or even a slim bootcut jean. Over tees, chambray shirts and even print blouses, the Boyfriend is your go-to jacket for weekends and casual workwear. Click on the carousel of Sherry below, in the Boyfriend Jacket, in a pinstripe woven fabric to scroll right and see all the images. The Boyfriend jacket has bust darts in the larger sizes for shaping. Simply fold and stitch the dart on your sewing machine (straight stitch) and press the dart down toward the bottom of the jacket, construct the rest of the jacket as usual. Fitted Jackets - such as a classic notch collar jacket or a shirt-collar style jacket - all feature seaming details that shape the jacket - and the body's visual curves - into a sleek line. They're of course a classic suit jacket, but we like them far better with jeans. You can do a lot with a classic jacket that is unlined. Boucle, wool tweed, wool flannel, linen, denim, printed canvas cottons and home decorating fabrics, jacquards all look great in fitted jackets. Of course, don't ignore the knits either - ponte and cotton-lycra make delightful jackets that feel like sweatshirts! The possibilities are endless with the choices of both woven and knit fabrics for classic fitted jackets. A jacquard home-dec fabric in a jacket is a very upscale option that adds polish to a tee and jeans for a date night out. But that same jacket in a cotton/lycra with a contrast print cotton/lycra under the collar goes easily to the kids' sports practice, too. These jackets are both made of wool, feature classic buttons and a contrast under collar. Skip those complicated pockets but do add the fun buttons to the sleeves of your jackets. Shown with classic striped tees and jeans, these jackets will stand the test of time in your wardrobe. Fitted jackets are (typically) shorter than the Boyfriend style, but the Princess Jacket also comes in a long length, which looks incredible with a knee-length dress. Make sure it's an easy to construct jacket! Jackets can be one of those "I'm afraid of a big, complicated project" types of sewing projects. These jackets are EASY to sew! All are unlined and feature serger contstruction, professional ready-to-wear sewing methods for perfectly pointed collars and stitched-down facings to keep the interiors of the jackets as beautiful as the outside. They are great first-time jacket projects and even the Fitted Jacket, with it's two-piece sleeve, and body panels, is a less-than-four-hour jacket sewing project. You can have a whole wardrobe of jackets to wear over your tees and jeans. Under collars, double collars all look fabulous in contrast or coordinating fabrics. Interior back-neck facings look incredible using a contrast or print fabric (scraps from other projects are perfect for this) with your custom labels sewn on. You'll be proud to swing that jacket over the back of the chair when out with friends to show off your creativity. These looks, from our Pinterest board (click on the image to go to Pinterest) show the diversity and polish a jacket can give even to a simple outfit.